Escalating competitive pressures, tight budgets and scarce capital resources are working in concert to intensify the importance of true alignment between IT and the organization it supports. But many of today’s enterprises are noticing a decided gap between what the business demands of IT and the realities of what IT can deliver. 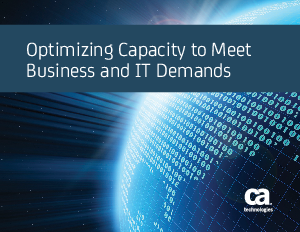 Much of this disconnect can be attributed to the fact that many IT departments struggle to understand how capacity is allocated and consumed throughout the data center. This lack of visibility breeds considerable challenges. This white paper outlines these challenges, how they can be overcome and the capacity management solutions available. Download now to find out more.